Skilled care during pregnancy, birth and the postnatal period is vital to the survival and health of mothers and newborns. In fact, the wellbeing of a society is represented by the health of mothers, newborns and children. To this end, the United Nations has determined that the number of births assisted by a skilled attendant is one of the indicators of progress in a country. 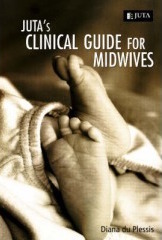 Juta’s Clinical Guide for Midwives is a user-friendly, highly illustrated clinical manual developed to provide all midwives with up-to-date knowledge and practical skills. Undergraduate nursing students following the comprehensive 4-year training program where midwifery is an integrated part, as well as Practising Midwives, midwives wishing to update their clinical skills and medical practitioners. Juta’s Clinical Guide for Midwives is a user-friendly, highly illustrated clinical manual developed to provide all midwives with up-to-date knowledge and practical skills. Step-by-step instructions for carrying out procedures, along with a rationale for each; clinical tips drawn from years of midwifery experience; clear illustrations to demonstrate difficult procedures or concepts. Contents include the following: Antenatal, Second and third stages of labour and Post Natal. For the full Index, see the link below.